Christopher Reeve at work. "On Memorial Day weekend, 1995, my world changed forever"--Christopher Reeve, in Still Me. Death in the Tarot implies major transformative life change, the ending of an old way of life and beginning of a new. The bigger the change, the larger the potential lessons. 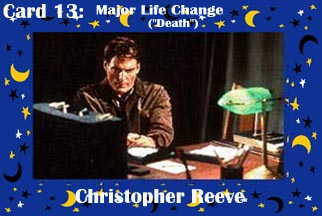 Christopher Reeve is a Level 2 Death archetype. His accident was horrible beyond nightmares. But his response to his life change has been astonishing and inspiring. He has responded like a true Archetype, greater than imaginable, larger than life. He says that he will walk again. We believe him. He embodies this archetype, and Transformation is who he is. Christopher Reeve at his desk is from Christopher Reeve Homepage.